[toc]Are you one of those millions who are really careful about their skin and hair and quite conscious about their looks and appearance? Do you really feel that beauty plays a significant role in not only making heads turn but also in leaving a lasting first impression? As one of these people, do you also believe that flawless beauty is not only highly appreciated but also something that boosts the self confidence? If yes, then you must have a real idea about the deadly signs of ageing that hinders your aims and gives you a dull, ugly and aged look. There are a handful of ageing signs and wrinkles are one of the most common ones that is simply a nightmare for most women. In simple terms, wrinkles are fine lines on the face that tends to reduce the attraction and charm of the person. It usually happens when the skin starts losing its elasticity. However, for all you people out there who is facing this serious danger to their personality can refer to the guide below. It has some of the top notch ways that if followed on a regular basis can actually help in getting complete rid of wrinkles. One of the best things you can do is adhere to a regular routine of using grape oil on the affected areas of wrinkles. The moisturizing properties help in keeping the skin healthy and nourished and in maintaining skin youthfulness and elasticity. Along with this, the dual benefit comes in the form of lightening the scars on the skin. Rejuvenation of the Epidermis is done that in turn fights the wrinkles in an effective manner. The high levels of anti oxidants in the oil are useful in keeping all kinds of skin problems away and combating the existing ones. Make sure you use it daily on the skin for ideal outcomes. The significance of avocados for both skin as well as hair is something that is undeniable. The value of avocados starts from the positive effects that it has on the epidermis. Regular application as well as intake of avocados helps in removal of under eye wrinkles in a flawless way. Freshly mashed fruit can be applied on the facial skin and left for about 15-20 minutes before rinsing. Following this method for at least a couple of weeks will start giving you the visible results in hand. Slices of freshly ct cucumber can be kept on the eyes for about 15-20 minutes each day if your aim is to fight off those ugly wrinkles from the face and under the eyes. It is also known to reduce the puffiness under the eyes and gives you a refreshed look and one that people will envy. 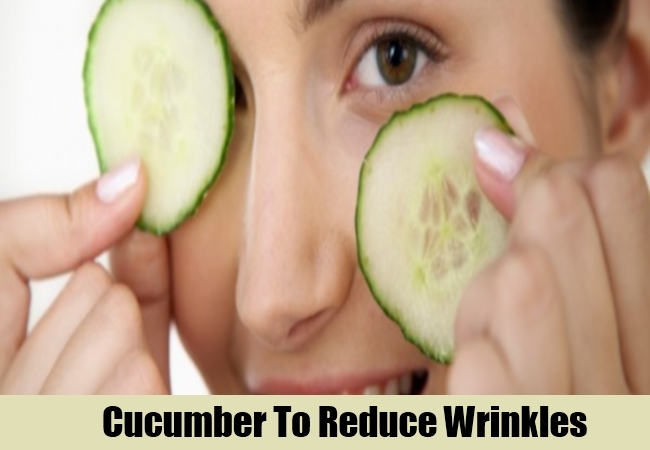 Using cucumbers for wrinkle eradication is not only effective but also safe and affordable on the pocket. According to professionals, this is one of the most well reviewed measures to be taken. Fresh and sugar free orange juice is loaded with vitamin C and antioxidants that helps in not only getting rid of wrinkles but also brings the skin to a healthy and flaw less situation. All you need is a clean ball of cotton using which you can apply this liquid on the wrinkles and leave it for about half an hour. This should be rinsed. Follow this routine method daily for a month to see how well the wrinkles fade and gives you a rejuvenated look. Drinking good amounts of plain and filtered water not only flushes out the accumulated dirt, oil and bacteria on the skin that causes the ageing and damage in the long run but also regulates the functioning and rejuvenates the skin cell membranes. It helps in hydrating the skin cells and as a result brings elasticity on the skin. Having about 8-10 glasses of water each day will conveniently take you to your goals without any effort. Apart from this, you can also include other healthy liquids like fresh fruit juices, coconut water and herbal teas to get a dual benefit of vitamins, minerals and antioxidants. Every heard about the concept of beauty sleep? Yes, sleep and that too proper and sound is very much important not only for good health but also for good skin. About 8 hours of sleep each day is the most important thing that you need to follow. This will not only help you get rid of wrinkles but also from dark circles. Make sure you are not disturbed during that time. This is definitely going to treat the ugly lines you dread so much. Whether you are an active smoker or a passive one, underline the fact that smoke will definitely cause a lot of skin problems and lead to formation of wrinkles way before your ageing signs should occur. If you want to treat the lines and get back that youthful look, then quit smoking at once. This is one tip that should be taken seriously since it has a lot of other side effects on the body as well. Stress is another of the significant aspects that has major repercussions on the body, skin as well as the hair. If you want to know, it is one of the major reasons associated with occurrence of wrinkles. Stress management is very important if you want to treat the wrinkles on the skin. Adhere to yoga, meditation and other relaxation techniques to ensure that you stay stress free. Recreational activities can be done to relax the mind a bit. Also, avoid overloading yourself with work. The UV rays of the sun are known to cause a lot of damage to the skin and lead it towards ageing in a much faster process. To safeguard the skin from ageing signs as well as to treat the already existing problems like wrinkles, all you need to do is apply a good quality and high quantity SPF content each day while stepping out of the house. This is a researched and reviewed way of treating wrinkles.